Sail beneath the blue skies of the Mediterranean sea, stop at a secluded beach for swimming and snorkeling, and visit a delicious local restaurant. This private trip is yours to do as you please. We can accommodate any type of tour: party, business, family, fishing, navigation training, etc. • More than 11 people trips. • 2 days trips (1 night in a different port). • 3-7 day excursions through Costa Brava. • 5-15 day excursions in the Balearic Islands (Ibiza, Formentera, Menorca, or Mallorca). 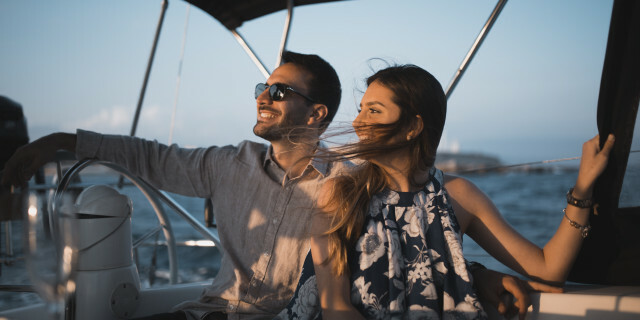 Four hours of sailing with your own personal skipper, seeing and doing whatever you wish - that's what this sailboat tour is meant for. 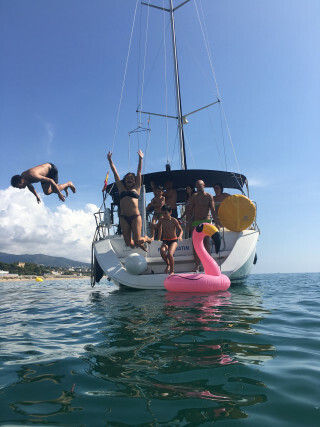 Because we're on the water longer than our shorter trips, we can sail to the charming village of Montgat, with quiet beaches perfect for a swim or some snorkeling. And if you prefer eating lunch in a restaurant, we can anchor in Badalona's port and enjoy some fresh, delicious food while looking out to sea. 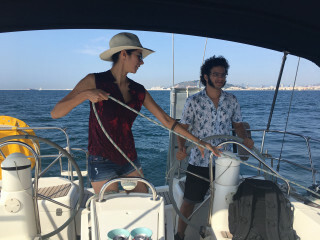 With the option to play your own music on the boat's speakers, along with the many drinks and appetizers we have onboard (feel free to bring more of your own), you'll have everything you could want as you enjoy the Spanish sunshine and, if the weather permits, the cooling waves of the sea. 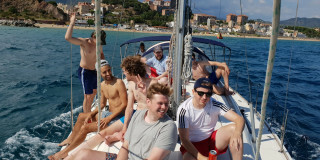 After meeting at the Port Olimpic in Barcelona, you and your group chat with the skipper to decide which route you'll be taking. 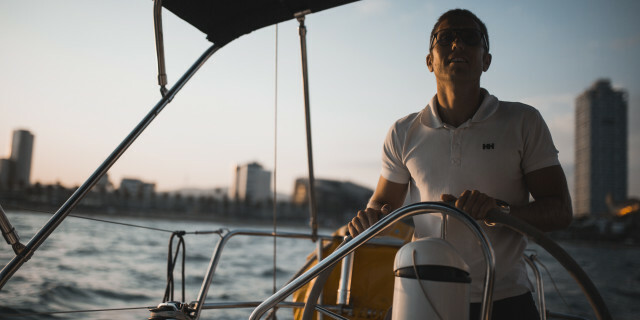 The skipper considers your expectations, plus the weather, wind, and sea conditions and chooses one of three sailing courses. 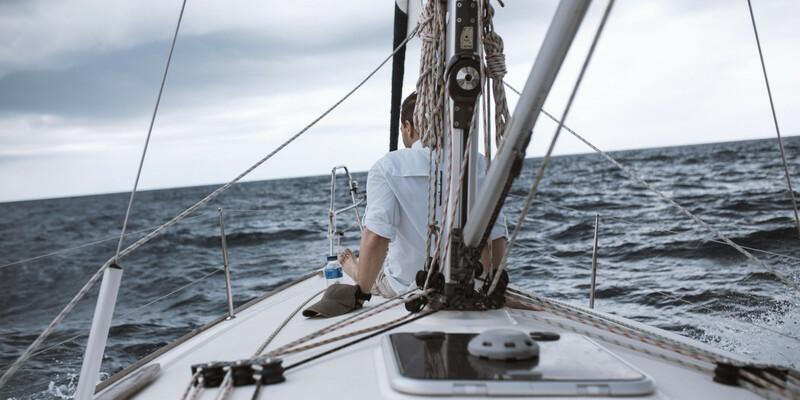 You then board your luxurious sailboat and sail out into the sparkling open sea. The first route takes you northeast and shows off the best of Barcelona's skyline. From the charming former fishing village that is now Barcelona neighborhood, to the Olympic Village and the famous Bogatell and Mar Bella beaches, there is plenty to admire as you sit back and relax. Depending on the weather, we stop at Badalona beach, considered by many as the most beautiful beach in the area. There are touches of incredibly rich culture reaching back to the 3rd century BC, when Romans founded the original city - Baetulo. Mixed with soft sand and the Mediterranean sea splashing the shore, its unique energy charms all visitors. The second route takes us furthest into the open sea, reaching the greatest depth of all three routes as we follow the southwest wind, Garbi. You are far away from the noise of the city, yet still have the panoramic views of the previous route. The third route leads us to the famous waterfront harbor Port Vell, with the Columbus statue, the picturesque, tree-lined La Rambla street, and the OneOcean port, which is home to many "superyachts". Take half a day to hop aboard and enjoy the boat life however your heart desires. Let the wind guide you on this exclusive private sailing trip. Enjoy snacks and refreshing drinks as you listen to music, admiring postcard views of Barcelona from the Mediterranean Sea. 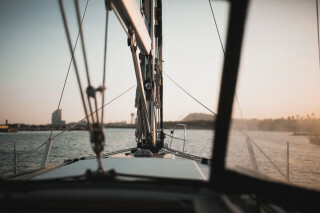 Float along Barcelona's coastline as you enjoy appetizers, drinks, music, and the feeling of being absolutely carefree. Or use the opportunity and learn about sailing and navigating the seas. Embark on a journey along the coast of Barcelona, sailing to various stunning beaches. Swim, snorkel, jump, laugh, relax - we make this day as memorable as you wish.